There is a philosophy deeply ingrained in Dutch football. First adopted over 10 years ago and implemented by many top level professional teams, it is the idea that every youngster hoping to become an elite player should be touching the ball 10,000 times per day. Malcolm Gladwell’s infamous 10,000 hour rule, in which he suggests that those wishing to reach a world class level in their particular discipline should amass at least 10,000 hours in focused practice, is remarkably similar in theory. Whilst there are many skills and disciplines in which this can be achieved; counting hours in the context of team sports isn’t ideal. One could play a full 90 minute game of football and only touch the ball 30 times. What is measurable however is the concept of individual touches. Instead of aiming for 10,000 hours of ‘play’, young Dutch footballers are being trained to perform 10,000 touches per day as an alternative route to mastery. Each player had a ball and assembled into groups of six and, after hearing instructions, the whistle blew. The entire field of players began a series of ball touches in unison while the crew of coaches clicked away with the counters. It didn’t take me long to figure out what was happening; these players worked through rehearsed ball movements in sets of 100-200 repetitions, at match speed. After rounds of toe-touches, Cruyff turns, drag-backs, pirouettes, juggles, dribbles, or paired one-touch passing the players rested, rotated to a different station, and began another set targeting a different skill. Another area of skill acquisition named ‘the Coerver method’, is often used to structure these 10,000 touches into a series of specific drills focused on reducing complex movements into simple, habitual patterns. Developed by Wiel Coerver, his method involves analysing elite performers and reverse engineers their skills into a structured, pyramidal system of learning; thereby breaking down these 10,000 touches into specific areas such as passing, moving forwards with speed and finishing. My father yells everything twice, sometimes three times, sometimes 10. Harder, he says, harder. But what’s the use? No matter how hard I hit a ball, no matter how early, another ball comes back. Every ball I send across the net joins the thousands that already cover the court. Not hundreds. Thousands. They roll toward me in perpetual waves. I have no room to turn, to step, to pivot. I can’t move without stepping on a ball—yet I can’t step on a ball, because my father won’t bear it. Step on one of my father’s tennis balls and he’ll howl as if you stepped on his eyeball. Every third ball fired by the dragon hits a ball already on the ground, causing a crazy sideways hop. I adjust at the last second, catch the ball early, and hit it smartly across the net. I know this is no ordinary reflex. I know there are few children in the world who could have seen that ball, let alone hit it. But I take no pride in my reflexes, and I get no credit. It’s what I’m supposed to do. Every hit is expected, every miss a crisis. My father says that if I hit 2,500 balls each day, I’ll hit 17,500 balls each week, and at the end of one year I’ll have hit nearly one million balls. He believes in math. Numbers, he says, don’t lie. A child who hits one million balls each year will be unbeatable. 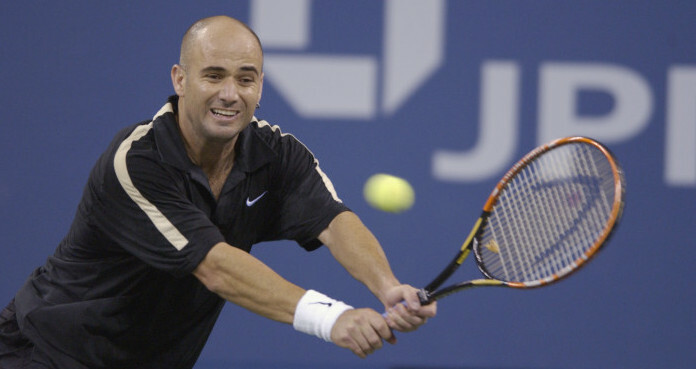 In a sport such as Tennis, it is unrealistic to perform 10,000 touches in a single day but Emmanuel “Mike” Agassi clearly had a vision for his son, and a method in which he believed would set Andre apart from every other player his age. Here, the arbitrary goal was to hit one million balls in one year. A grand task, yet the only possibly outcome was one of excellence. The 10,000 hour rule can be daunting due to the huge time scale involved in reaching this milestone. However, by using the 10,000 ‘touches’ theory, we can scale this huge task into an attainable goal which yields quicker results. Unknowingly, I used this method during my first few years learning how to play the guitar. I would take a specific riff or series of notes, memorise the pattern and then, whilst watching a movie, would perform this sequence of notes over and over again. Take the opening riff to ‘Sweet Child O’Mine’ as an example. I would first commit these 8 notes to memory and then watch a movie whilst continuously playing this riff. What’s the maths here? Let’s say, 8 notes every 2 seconds. That’s 30 riffs per minute. 30 x 8 = 240 notes per minute. 240 x 90 = 21,600 notes per movie. Give or take for the occasional mini break. That’s a lot of notes, and broken down this means I would play this riff approximately 2,700 times. I would use this method for anything which I found particularly tricky. Writing – You could easily write 10,000 characters every day or read 10,000 words from your favourite author/writer/blogger. Language learning – A combination of 10,000 words worth of writing, speaking and listening every day is achievable. On average we speak 16,000 words a day so aiming for a 50/50 split of 5,000 words speaking and 5,000 words listening is a great target. Playing a musical instrument – Like my example above; you could learn small pieces of music and play them repeatedly whilst performing another task such as watching TV. In the gym – A friend of mine regularly counts the total poundage of the weights he lifts instead of the actual reps/sets as one barometer of his success. Aiming for 10,000 pounds or 10,000 kilos per workout is a great way to continually push the boundaries. Running – There is roughly 2000-2500 steps to a mile, so if you’re an intermediate/advanced runner, aiming for an average of 70,000 steps per week (accounting for rest days) will do wonders for your cardiovascular fitness and body fat levels. Of course, these steps can be alternated between running and walking for those who have yet to reach this standard. I’m sure that every skill or goal can be broken down in this way so find something in which you wish to improve and work out how you can implement the 10,000 touches principle into your everyday schedule. The key here is consistent daily practice. Yet this practice should be sufficiently challenging enough so that you make continual progress towards your goal. That’s where the 10,000 touches philosophy proves to be so powerful. It is a number that is large enough to require effort and a stretch of your comfort zone, yet is small enough to be attainable by the vast majority of those who attempt it. How can you implement this in your every day life? Have you done something similar? Let me know in the comments below! I think it’s very different for sports and arts. For sports, the “10,000” is a pretty good gauge I would say. There’s a lot more focus on quantity and “mindless” practising. Getting your skill so good that it becomes a habit. But for music, a lot more is involved than just clocking in the notes. It’s also a lot less intuitive. You may think you’re practising the right way when you’re not whereas for badminton, if I want to practise a smash, basically I know for myself when I’m getting better. If the shuttle is moving steeper and the chances of if still crossing the net is getting higher, then I can say for sure I’m getting better at this particular technique. You see, I would say it’s the other way round. It’s easier to implement via arts than sports. The original 10,000 hour study was used with violin students and as arts usually isn’t physically demanding, it is easier to rack up those hours. With regards to you badminton example – results don’t always been success. You could be getting the shuttle over the net but with poor technique. A good coach could sort that out so even though you may be scoring points, you may not be aware of any technique issues. But as you say, that is true with the guitarist playing notes. But then again, I think you are talking about beginners. Intermediate or advanced players of both types of discipline will already know if they are performing the technique correctly. Thanks for you thoughts. It’s an interesting one. Your response prompted me to read up on this 10,000 hour thing. I’ve been hearing this rule everywhere but it’s only now that I know it was a study originally used on violin students. Thanks for that man, glad I learned something new. Maybe I’m biased but I always thought there’s nothing much to sports, haha. If you have a robot shooting shuttles repeatedly at where ever you want on the court, and you just clock in those hours perfecting a smash or whatever technique, you can get good soon enough no matter what. Even without a coach. Haha, at least that’s what I always thought. But I know for a fact and I’m 100% convinced that you can practise a piano technique for as long as you like and NEVER get it right. I just think musicians need to be engaging a lot more of their senses for mindful practising. Here’s a fun little video of one of my favourite pianists. This is ONE technique many pianists will NEVER get in their entire lifetime. Taking Sweet Child O’Mine as an example again. The intro was originally designed by Slash to be a warm up exercise. It’s just a series of 8 notes played in a row without any rhythm or thought needed. The solo however includes string bending, vibrato, positional changes and timing. Therefore while there are ‘mechanical’ licks within, a lot of it needs to be played with feeling and emotion to sound just right. When we learn a technique, we initially use our ‘conscious’ brain but over time this gets stored into long term memory which lies in a separate section. This is why people mess up when nervous; their conscious brain takes over and tries to remember, but of course it’s stored in a different location so it struggles to perform. Confident players don’t engage their conscious brain when playing, thus their piece/technique flows smoothly as it should. Like I said in the article, I memorised the riff initially, and then unconsciously played it repeatedly whilst performing another task. My conscious brain was watching the movie and my unconscious brain was taking control of the guitar technique (which I had already memorised). Of course this is a heavily simplified explanation, and there is more to it than what I just said, but that’s the gist of it. Every technique is indeed attainable from practise, but if not done right (not matter how advanced you are), you can practise forever and will never get it right. You can even hurt yourself, which happens to many even at the concert level. Specifically for that technique in the video, many pianists even at the professional level (playing for more than 10 years) have trouble mastering that. It’s a world-class technique, I’m not sure if you’re seeing right what she’s playing. Gotta agree to disagree here.. I think we have our wires crossed haha. I’m not entirely sure what you mean and you’re not entirely sure what I mean.. I agree with you, bad practice is worse than no practice. That’s why we have coaches, teachers and tutors.. to set us on the right path. I have experience playing world class techniques on the guitar and the mechanics are fairly easy to ‘get’, however speeding it up and playing it flawlessly takes years of hard work. But yeh, you gotta get the basics of every technique first before you press on, that’s a given! Take the opening riff to ‘Sweet Child O’Mine’ as an example. I would first commit these 8 notes to memory and then watch a movie whilst continuously playing this riff. Ok, ok, so play that during an entire movie? Over and over again? Now I get this whole practicing guitar thing. That helped a lot. Yeh that’s what I did. Just those 8 notes on repeat. I wanted to make sure my left and right hands were in sync and that my alternate picking (down, up, down, up) was clean and clear. I am a huge believer of repetition and consistency. It’s literally changed my life. I like your practical examples. I think in the same way. –I look forward to reading your Arnold post! I haven’t read that book, but I have a feeling it is similar to a book called ‘Bounce’ which again, is based on what I just wrote about. I will definitely check it out, thanks. Jamie – not sure how we have missed each other on the blogosphere. Loving your blog (writing) and perspective on most things (although may not agree with all of it 🙂 ) You call it out as it is and are walking the walk. I agree with Gladwell’s 10,000 hour rule and the 10,000 touch rule you talk about in this post. For me, I’m trying to apply this rule to writing. Daily practice over a long period of time has undoubtedly improved my writing. Doing it consistently has been key but it’s really the passion behind it is what keeps me going. Could I do something I absolutely hated for the sake of getting good at it? Probably not. Well probably but I don’t think I’d want to. You’re right there, if you keep writing every day then you can’t fail to improve. Getting better is the only possible outcome! I’m a big fan of intense repetition. There are so many examples in sports, art, science, and more about people who love what they do so much (or have overbearing parents) that hitting that 10,000 number is really not that hard. And so they consistently do that, over and over, until they really are great. I also think that people who master skills can’t help but look elsewhere for inspiration during their learning process. I doubt anyone could really play the same notes for 10,000 hours. At some point, they’d look elsewhere, talk to others, and learn new ideas/skills, so by the end they would have practiced 10,000 hours of numerous things. I know that we often love shortcuts these days and are constantly looking for ways of getting ahead without spending the time, but in the end it’s impossible to master a skill without the time and dedication. Hey Ryan, Of course, the 10,000 hours covers every aspect of the skill, from applying various techniques, education, watching, listening, interacting etc etc. You’re right about shortcuts. If you have the mentality that you can somehow cheat your way to success, it will never happen for you. You truly get out what you put in. It’s all about consistency – big or small. Even if we can’t get our 10000 touches daily, doing 1000, 100, or even 1 touch can give huge impact if we do it every day. It’s because people who are consistent is hard to find; those who are consistent have booked their ticket to become better than average because they are constantly moving while their peers stay put. You’re right, Wan. Every day is the key to success. Getting that consistency and maintaining it is what separates the good from the great! Its your consistency that matters over anything, may it be your success or any other practice. Thanks for this post.